In normal conditions, whether you take a downstream or upstream Yangtze River cruise between Chongqing and Yichang, you embark / disembark at Chongqing Chaotianmen Port (朝天门码头), Yichang New Century Port (新世纪码头) / Taohuacun Port (桃花村码头) at the scheduled time in your itinerary. However, some ports may be changed during some special events. Let’s check the detail change of ports in Chongqing and Yichang cities. If any changes of the port of your Yangtze River cruise, your Travel Consultant would tell you when you book the ship and help sincerely you till the end of your cruise. The port would be changed to Fengdu Port (丰都码头) that is about 150 kilometers away from Chongqing downtown for your downstream embarkation and upstream disembarkation. Therefore, you should know clearly about the locations of Chonqging Grand Theater (重庆大剧院), Chongqing Jiangbei International Airport (重庆江北国际机场), Chongqing Railway Stations, and Fengdu Port before your cruise. The cruise companies will take the responsibility to arrange tourist buses to transfer travellers from Chongqing Grand Theater to Fengdu Port for downstream embarkation and from Fengdu Port to Chongqing Grand Theater for upstream disembarkation. Therefore, travellers don’t have to worry about the transportation. During special events, on Day 1 of the downstream cruise, travellers are required to gather at Chongqing Grand Theater first, during 18:00 – 19:30. 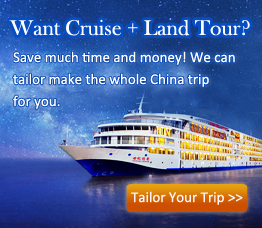 The cruise company will arrange buses to transfer you to Fengdu Port to board your ship. Fengdu Port is 150 kilometers away from Chongqing downtown and needs about 2.5 to 3 hours to get to. 2. Please make sure to get on the arranged bus to Fengdu Port on time. Otherwise, contact your travel consultant right away, and we will arrange the private transfer for you to arrive at the port for extra fee! On Day 5 of the upstream cruise from Yichang during the special periods, guests leave the cruise ship at Fengdu Port in the morning, at 06:00-08:00. The cruise company would arrange buses for the transfer from Fengdu Port to Chongqing Grand Theater at the downtown area. The bus driving time is about 2.5 – 3 hours. Cruise trip ends. There are several ways to transfer from Chongqing Jiangbei Airport / Chongqing North Railway Station / Chongqing Railway Station to Chongqing Grand Theater, among which taking a local taxi is the most time-saving and convenient way for you Yangtze River cruise. Check the time and distance needed at below! Note: the above time and distances are only for your reference, and detail data are varied according to the practical situation. The port would be changed to Maoping Port (茅坪码头), which is about 50 kilometers away from Yichang downtown. 2019 port change news: In the whole year of 2019 Yichang New Century Port is stopped using. All Yangtze River cruise ships would use Maoping Port for Yichang embarkation and disembarkation, except Yangtze 1 cruise using Sandouping Dock . So, you should know clear about the locations of Yichang Sanxia Airport (宜昌三峡机场), Yichang railway stations, Maoping Port (Sandouping Dock) , and Yichang Three Gorges Center Cruise Terminal / Yichang No.9 Dock (宜昌九码头) before your Yangtze River cruise trip. Since the cruise company would arrange buses to transfer the upstream guests from Yichang downtown to Maoping Port and the downstream guests from Maoping to Yichang city, guests needn’t worry about the transportation, moreover, they can still enjoy the views of the Three Gorges Dam site and five-stage ship locks. 16:00-21:30 Yichang Three Gorges Center Cruise Terminal (宜昌三峡游客中心) or Yichang East Railway Station (宜昌东站 ) Take the bus arranged by the cruise company to Maoping Port to embark your cruise ship. 19:00-20:00 Yichang Three Gorges Center Cruise Terminal (宜昌三峡游客中心) Take the bus arranged by the cruise company to Sandouping Dock to embark your cruise ship. 2. Yichang East Railway Station Address: Chengdong Avenue, Wujiagang District, Yichang City 湖北省宜昌市伍家岗区城东大道 – 宜昌东站. 3. Yichang gathering place choosing: if you are arriving in Yichang by train, we suggest you gather directly at the Yichang East Railway Station, where you could easily find the arranged bus after exiting; if you arrive by plane, you could choose to gather at Yichang Three Gorges Center Cruise Terminal. 4. Please make sure to get to the bus from Yichang downtown to Maoping Port / Sandouping Dock on time. Otherwise, contact your travel consultant immediately, and we will arrange the private vehicle to transfer you to the port to board your ship for some extra pay! On Day 4 of the downstream cruise to Yichang during special events, you would visit the Three Gorges Dam Site (or optional experience of the ship lift) and then leave from the Site. The cruise company would take the responsibility to arrange the tourist buses to transfer you from the Dam site to Yichang Three Gorges Center Cruise Terminal. After driving for about 1 to 1.5 hours, you would get to Yichang downtown during 12:30-13:30. Yangtze River cruise tour ends! Among all the means of transportation to Yichang gathering places, taking the local taxi is the best one. Check the detail distances and time needed at below. If you got any questions about Yangtze River cruise port change, please ask our professional Travel Consultant for help!